What’s New at Santa Rita Winery? Chile is blessed with perfect conditions to grow grapes; a varied climate, warmer and drier in the north, and wetter and cooler in the south. A dry climate and soil types not conducive to the phyloxera louse allow Chilean vineyards to be grown on their own rootstock, not grafted. Some say that this allows you to taste the “true” flavour of each grape. One of the many quality wineries in Chile, with a long wine making tradition, is Santa Rita. This week I was given the opportunity to try the latest wine releases, plus the premiere of a newly released wine by Santa Rita. Thanks to Brix Restaurant in Yaletown for hosting the winery and serving us some cheese and fruit to go with the wines. The first three wines are from their entry level tier. They are all straightforward wines which you should open now and enjoy. 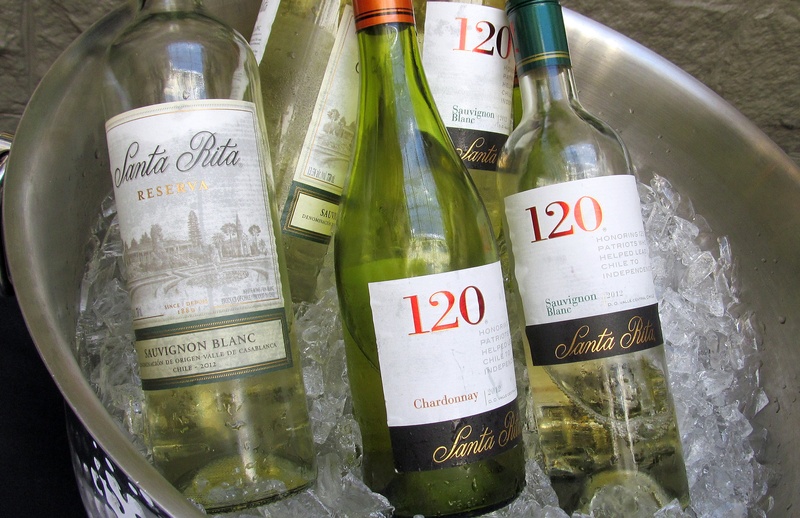 Santa Rita 120 Sauvignon Blanc 2012 ($12.99) – Light stone fruit nose with citrus and herbal notes. Light body, dry, with stone fruit, citrus, and lemon peel flavours. Medium length with a mouthwatering finish. Good for a hot summer day. Santa Rita 120 Chardonnay 2012 ($12.99) – Medium tropical fruit and vanilla nose. Round with medium body. Tropical fruit and pineapple with some sweet spice mid palate. reen apples on the finish. Goes well with soft/creamy cheese. A bit more full bodied than the Sauvignon Blanc. Santa Rita 120 Cabernet Sauvignon 2012 ($12.99) – Medium plus ruby in colour. Perfumy, blueberries, candied cherries and vanilla aromas. Primarily juicy red fruit with some sweet spices and soft tannins. Dry with medium body. A light bodied Cab. Give it a slight chill before serving. Moving up the quality scale we have the Reserva level wines. One thing that I note about Santa Rita’s Reserva level wines is that they over deliver for the price. Santa Rita Reserva Sauvignon Blanc 2012 ($14.99)- Very aromatic nose with herbaceous notes, jalapeno peppers and a bit of perfume. More jalapeno on the palate. Dry, light body and quite flavourful. A lower level of acidity than the 120, but still there on the finish. Santa Rita Reserva Pinot Noir 2009 ($15.99) – Light aromas of sweet red cherries and violets. Medium minus body, dry with medium minus tannins. Light mouth feel, with flavours of red cherries, violets and cinnamon. An OK wine, but a little too understated. Santa Rita Reserva Malbec 2009 ($14.99) – Deep ruby colour. Coats the glass and leaves lots of legs. Lots of ripe, juicy purple fruit and vanilla / oak aromas. Medium plus body, soft tannins, with purple fruit, cherries and blueberries on the palate. Medium length with a soft finish. 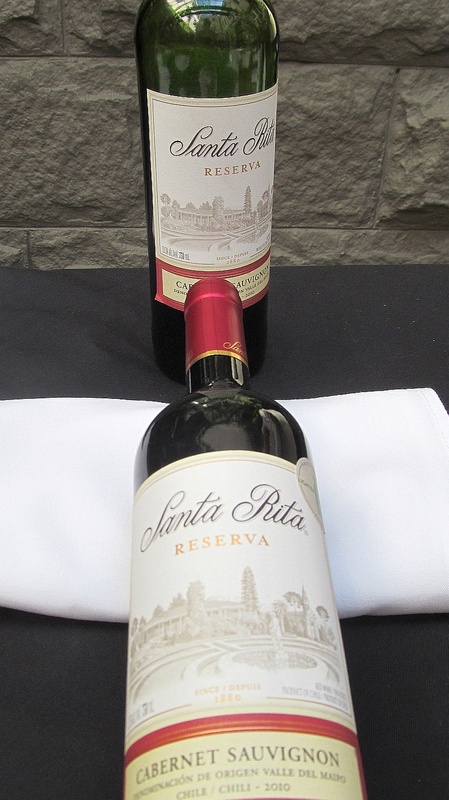 Santa Rita Reserva Cabernet Sauvignon 2010 ($14.99) – Darker garnet in colour. Dark fruit aromas, with some smoky, earthy notes and a hint of capsicum. Medium plus body, medium minus tannins. Vanilla, black and red fruit flavours, with spiciness on the mid palate. The cherry flavour grows as you swirl the wine around in your mouth. Dry finish with a medium length. Santa Rita Reserva Merlot 2010 ($14.99) – Cassis nose with a medium plus body. Cassis and plum flavours primarily together with some vanilla and sweet spcie. Sour cherries and vanilla, with grippier tannins on the finish. Nice. Santa Rita Medalla Real Cabernet Sauvignon 2009 ($22.99) – Deep garnet in the glass. Medium intensity nose with ripe black fruit and vanilla. Full body, very round, silky tannins. A bit hot and spicy on the tongue. Ripe red and black cherry flavours, and a nice streak of minerality through the wine. Peppery finish. 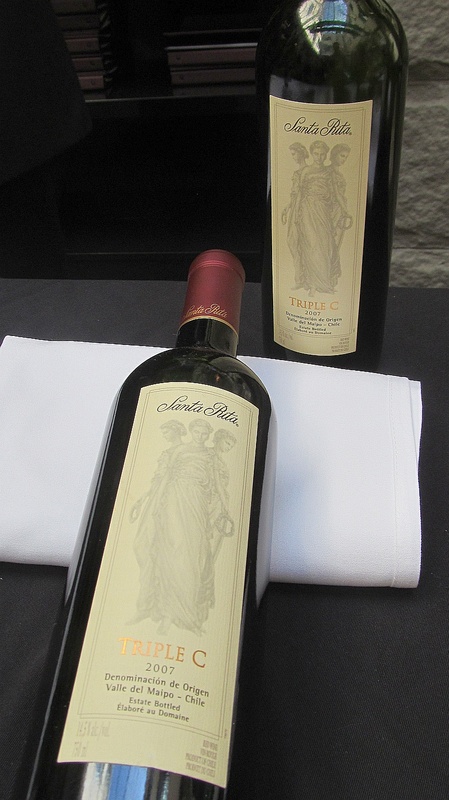 Santa Rita Triple C 2007 ($38.99) – This wine is a blend of 65% Cabernet Franc, 30% Cabernet Sauvignon, and 5% Carménère. Opaque garnet in colour. Ripe purple fruit on the nose with hints of perfume, vanilla and blueberries. Full body, dry on the palate. The fruit flavours build in your mouth, so please savour it. Lots of juicy purple fruit and blueberry flavours. Some spice too. Medium length but finishes a bit quickly. 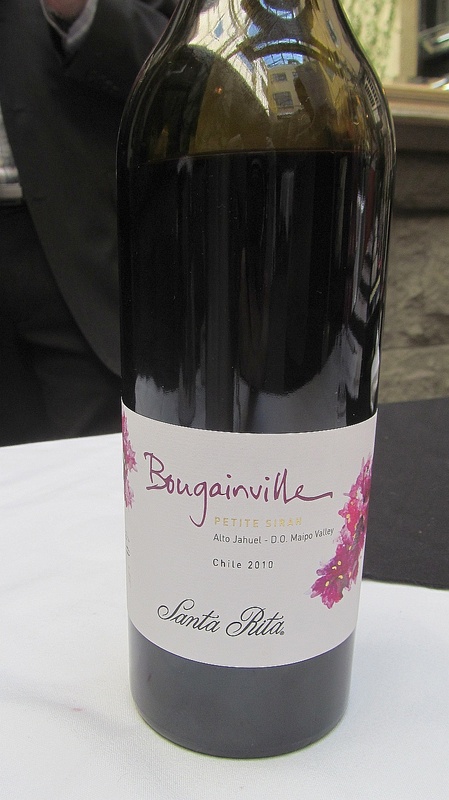 Santa Rita Bougainville Petite Sirah 2010 (~$80) is the newest wine for Santa Rita. It is one of their Top Tier wines. Launched with the 2010 vintage, Bougainville is a blend of 85% Petite Sirah from the Alto Jahuel region of Maipo and 15% Syrah from Limari (to give it some sweet intensity according to wine maker Andres Ilabaca). I rarely hear of Petite Sirah and Chile in the same sentence and was intruiged to try it. Each bottle is numbered, and we tasted bottle 07. Quite an honour and shows in my opinion how much Santa Rita appreciates the wine drinkers of BC. It was opaque in the glass with both a garnet and a ruby hue to it. Medium intensity nose with violets, purple fruit and vanilla aromas. Pencil lead flavour first surpised me on the palate, which was followed with ripe purple fruit and black pepper flavours. Dry, silky tannins and a medium mouth feel. A unique wine to share with guests. My favourite wines from the flight I tasted are the Reserva Sauvignon Blanc, Bougainville Petite Sirah, Reserva Merlot and the Medalla Real Cabernet Sauvignon. Enjoy.